This blog post is kindly contributed by ESA astronaut Samantha Cristoforetti who is following Soyuz training at Star City near Moscow. 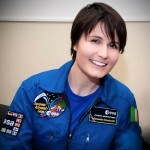 You can follow Samantha on Twitter at: @AstroSamantha. Today is a big day; I think I can say it loud. Well, for one thing I have passed my rendezvous exam this morning, the last one of the four dreaded exams on the Soyuz motion control system. Hurrà! 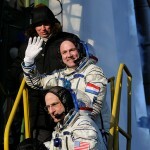 It’s a small, but significant step on the road that leads to a spaceflight, a road that my friend and colleague André Kuipers knows very well. 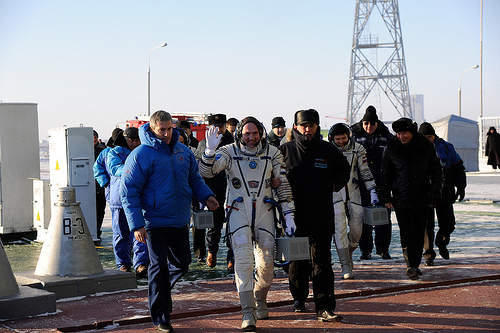 In just a few hours, he will walk the very last bit of that tortuous road to reach the launch pad, together with his commander Oleg Kononenko and crewmate Don Pettit. They will look awkward and clumsy, as their Sokol suits remind them at every step that they should be really lying in a foetal position and not walking about. 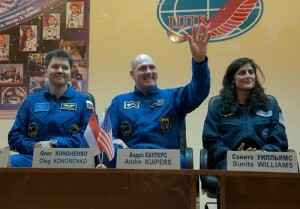 But their broad smiles of happiness and anticipation will light up Baikonour when they will turn around on that ladder to wave the last goodbye before boarding their spacecraft. Winter has finally come to Moscow. Yes, the first real snowfall of this unusually late winter has untimely arrived today, just when I face the unpredictable drive to the airport. Radio has announced that Moscow traffic is at a criticality level of 9, in a scale that goes to 10. That’s serious, and the reasonable thing to do is to leave Star City almost five hours before my flight. 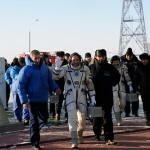 As I say my goodbyes, the crew in Baikonour is getting into the Sokol pressure suits for the final leak check before boarding the spacecraft. The odds are against me, but I still cherish the desperate hope of getting to the airport early enough to fully enjoy the launch before boarding my plane. Almost two hours into my painfully slow drive, I try to follow updates from Baikonour on Twitter, but only intermittently. I have to save battery – in the exam and departure rush I forgot to charge my phone! The twittersphere says that the crew is on the bus to the launch pad. I smile as I think that on the bus André might be watching the movie that crew support personnel at EAC prepared for him for this occasion. It’s a collection of short messages by friends and colleagues. I recorded one for him with Jean François Clervoy and Alex Gerst a few month back, as we were all floating in the zero-G plane. He will be floating himself very soon, and not for only 22 second! It’s T-2 hours and the Moscow traffic criticality is down to 6, according to the radio. All the 6 is obviously concentrated on this one road. 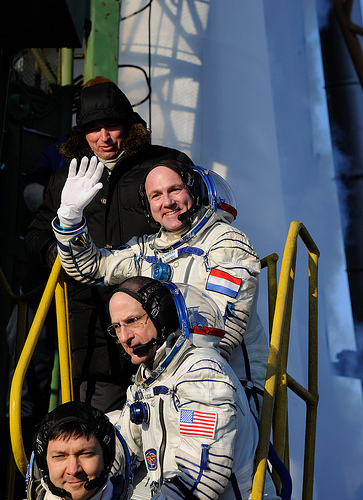 Crew is in the descent module by now. I wonder how it feels when the hatch to the orbital module closes. I fancy that it must be a moment of relief. Crewmembers are special people in the space business; they are in the centre of a big collective endeavour called spaceflight. But they also have to give a lot back, and in the weeks before launch demands, as necessary as they are, can be overwhelming. When that hatch finally closes, the only demand that remains is to perform flawlessly as a crewmember. It must be pleasant to feel the mind focus. Some apprehension about the imminent launch is inevitable, I think, but the calm routine of pre-launch procedures, rehearsed in countless hours in the simulator, must surely provide a solid anchor for the mind to settle down on some intermediate grounds between the comfort of the familiar and the uncertainties of the journey ahead. Of one thing I’m sure: André will never loose his characteristic cheerfulness. When I see the airport surroundings at last it is T-30, the Soyuz escape tower is armed and my phone is definitely dead. At T-5 I’m waiting for my turn at the body scan machine. Pre-launch operations must be completed by now. Oleg, André and Don have closed their helmets and can now fully direct their awareness to the extraordinary intensity of the moment. 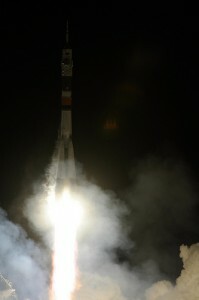 As the propellant lines are pressurized and the vehicle transferred to internal power, the rocket comes alive, impatient to unleash its power in an inferno of heat and pressure. I miss the launch. The 525-second-long ascent to orbit has already begun when I’m finally able to watch the webstream on my laptop. After 3rd stage separation, once the crew is safely in orbit, I watch and applaud in my heart as Oleg, André and Don join they hands in celebration. This is a wonderful crew! They will be fun to watch in the next five month.